When Janis Elliott of Carlisle retired from her junior high school teaching career, she was simply looking for a place to donate her collection of classroom books. By a stroke of luck, she found a willing and welcoming home for her library of books at CFUM. 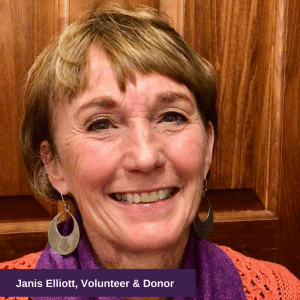 She never expected her donation would grow into such a satisfying six-year volunteer role. Week after week, she diligently came to read and be and encouraging friend to the children. She began to recognize just how valuable the programming was to children and their families. “Kids need more than what we as teachers can give them in the school hours and even more so, kids need structure after school. Those early years are so important for developing a child’s attitudes and behaviors and reinforcing their learning; those opportunities and foundations exist here,” said Elliott who credits the CFUM children for helping her find an outlet for her teaching heart. But when the waiting list grew to 90, Elliott said her heart broke. “I couldn’t imagine the parents of these 90 kids looking for a place for their children afterschool,” which is where Elliott admits things shifted. She loved giving back through her teaching talents, calling her volunteer presence, ‘just one more person here that these kids know cares.’ But she wanted to do more. With money she inherited, Elliott became a CFUM donor. She said she is excited about the future of CFUM and would love to see programming and the physical space expand. Discover ways you can give to CFUM in ways that fulfill your own heart.